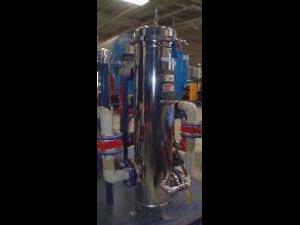 Memtec model 910802-300 7R30 cartridge filter housing, Vessel is rated at 150 psi @ 200 F. Inlet and outlet are 2" flange, relief valve on top cover. Top is slip-off with band clamps. Currently configured for 222 with flat caps but should fit most cartridge filters.